The Meadowbrook Farms sub-basin encompasses approximately 72 acres of residential property in the city of Chesterfield, Missouri. Located in the southern-most headwaters of the larger Creve Coeur Creek Watershed, the sub-basin has experienced the pressures of increasing urbanization. As a result, the sub-basin has changed in both planform and profile to accommodate the increase in urban stormwater runoff. The City of Chesterfield retained Intuition & Logic to perform a geomorphic analysis and develop a sub-basin management plan in accordance with the State of Missouri’s Storm Water Assistance Regulation (10 CRS 20-4.061). Intuition & Logic developed nineteen recommended interventions to improve the health and stability of the sub-basin. Included in the recommendations were grade controls to halt the advance of channel incision, vegetated sills to direct flow away from failing banks, and composite revetments to stabilize and repair eroding stream banks. The city has since used the management plan for future channel stabilization projects, applying soil bioengineering methods to regain physical stability and maintain the natural function of streams in the sub-basin. Intuition & Logic’s services continued with the preparation of construction plans to address the high priority projects identified in the sub-basin management report. 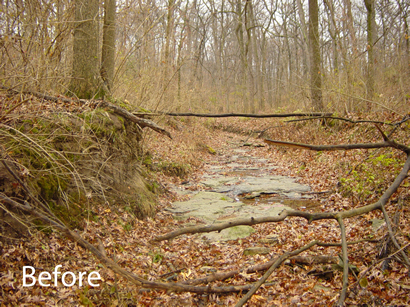 The projects included a rock grade control to stabilize the approach to the culvert below Baxter Road and the stabilization of 600 feet of incising tributary between Silverwood Court and Thistlebriar Court. 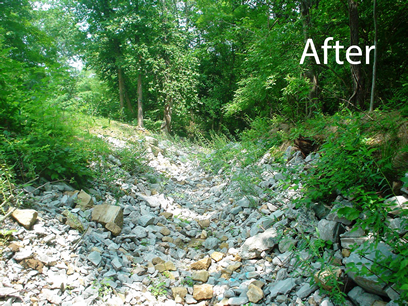 The existing failing gabion baskets and grouted riprap were replaced with rock grade controls and composite revetment bank stabilization. 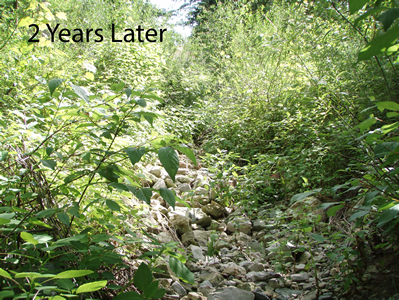 The stabilization halted property loss and restored the riparian corridor which had been severely degraded or missing along much of this reach.